Policy makers around the world are gradually coming to terms with the real possibility of a bird or avian H5NI influenza pandemic. From Washington, D.C., to London, Paris, and other industrialized countries, preparations to combat a possible pandemic among human beings are almost assuming war-like proportions as the bird flu influenza moves from Asia to parts of Europe. President George W. Bush recently requested the Congress to appropriate more than $7 billion for a robust national response to any epidemic. The United Kingdom is planning to purchase enough vaccine for all its citizens. France is ordering 200 million protective masks and anti-viral drugs for 14 million individuals. The World Health Organization (W.H.O.) is leading a coordinated global response through a new World Bank funded initiative. However, to date there is no coordinated response from Africa, its regional institutions or national governments. The possibility of a bird flu pandemic is worrisome for many reasons. First, the bird flu can cross over to humans with deadly consequences. According to the W.H.O., out of 125 confirmed cases of H5NI influenza in humans since December 2003, more than 50 percent (64 cases) died. Second, the H5NI virus can mutate very rapidly, increasing the chance of epidemics. Third, birds that survive an initial attack can pass on the virus for upwards of 10 days even without visible symptoms. During this period, unsuspecting bird handlers, farmers, veterinarians, and the general public may become exposed to the H5NI virus. The economic cost of a pandemic will be enormous. According to the World Bank, a one-year pandemic would lead to global economic losses of about $800 billion. African governments have a huge task ahead in planning a continental response to a possible bird flu pandemic. If a pandemic takes hold, African nations may experience significant reduction in external assistance as donor countries fend off epidemics at home. In addition, African leaders cannot rely solely on coordinated, global initiatives that often take time to reach intended target populations and are almost always focused on national-level activities. A comprehensive preventive or clinical response to H5NI human influenza will require coordinated response at community levels. 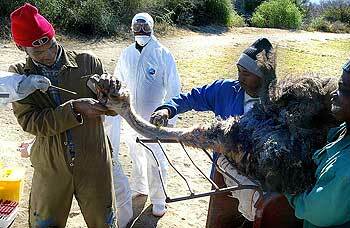 Without mincing words, it is important for Africa to plan a coordinated response to a possible avian flu pandemic. What are the strategic considerations of a possible African response to avian flu? 1. There may be no avian flu pandemic in the human population. Today, despite all the frenzied preparations, the H5NI influenza remains an infectious disease of animals. With aggressive animal control measures, the feared human pandemic may not occur or may occur at a level that could be contained, easily. A solid preparation now can ward off an emergency in the future. 2. A fairly effective preventive and containment strategy exists for animal control. Experts have benefited from the ongoing epidemiological surveillance in Asia. 3. Health systems and public safety infrastructure in many African countries are not robust enough to provide sustainable platforms for a coordinated response to a human form of the H5NI influenza. Health systems in many parts of Africa are in urgent need of financial, technical and logistical assistance. Public safety services remain inadequate in many African nations. 4. Other complementary infrastructure response in the face of a major human outbreak such as water supply, proper sanitation, regular electricity, real time information management systems, cross-border initiatives and road networks are not readily available in many parts of Africa. 5. Both animal control efforts and human preventive and clinical programs require significant financial investments that are beyond the capacities of most African nations. 6. A high mortality rate from human avian flu in Africa will have very significant repercussions for a continent dealing with the impact of H.I.V./AIDS and other infectious diseases. 7. Information, communication and education (I.E.C.) campaigns in Africa on health issues have spotty records. An I.E.C. campaign to mobilize the general population against avian flu will not be easy. 8. Lack of social safety nets in Africa will put severe strain on the political, financial, technical and logistics capacities of national and local governments to provide emergency response to outbreaks. These strategic considerations call for policy and operational agility on the part of African governments and institutions. It also calls for strong political action in recognizing the urgent need to prepare for an outbreak in both animals and humans. It is also important to begin these preparations without unduly alarming the general population. Since many national governments may have serious impediments in mobilizing financial and technical resources against an avian flu pandemic, the emphasis should most likely be on sharing resources with neighboring countries, utilizing the expertise of regional and subregional institutions, and, maximizing international technical assistance. 1. Preventing and containing H5NI influenza among animals, especially wild birds, domestic/commercial poultry and pigs. 2. Preparing to manage an outbreak among humans. Ultimately, the goal is to reduce drastically the opportunities for a human H5NI influenza. Fortunately, strategies for effective animal and human containment efforts are complementary. To ensure a comprehensive African response, it would be prudent to operate under certain overarching principles so that the needs and priorities of the continent become paramount. These principles should apply even when negotiating financial or technical assistance from international partners. First, African governments and institutions should take the lead in designing and implementing animal control efforts and emergency response in the human population. The African Union should provide strong political support at the heads of state level for a continent-wide initiative on avian flu. International partners should fill gaps identified by African governments and institutions. Second, the two major African institutions, the African Union (A.U.) and the African Development Bank (A.D.B.) should mobilize continental technical resources, especially veterinary, medical, public health, epidemiology and laboratory expertise at country, subregional and regional levels. These resources should be complemented by the clinical/public health expertise of the W.H.O. Africa region and the expertise of various U.N. agencies resident in African countries. Third, the ultimate focus of an African response against avian flu should be community-based surveillance and response mechanisms. This is crucial since most international initiatives will focus on strengthening national capacities rather than community-based systems. To implement a credible African response to potential bird flu pandemic, African policy makers, technical experts and other stakeholders need not reinvent the wheel. They should customize national and continental responses according to known remedial paradigms. Program considerations should focus on seamless linkages between animal control/containment efforts and contingency planning for outbreaks in the human population. A. Make citizens aware of the possibility of avian and human H5NI influenza. Without unduly alarming the population, governments and other stakeholders should conduct fact-based information, education and communication (I.E.C.) campaigns on the spread of avian flu in Asia and parts of Europe, the possible crossover into humans, the potential high mortality rates among humans and the real possibility of an epidemic in African countries. The campaign should particularly target handlers of domestic and commercial poultry, public health inspectors, farmers who own lands where seasonal migratory birds roost or feed, veterinarians, produce inspectors, community health workers who are often first responders in burgeoning epidemics, community leaders and local officials. B. Strengthen epidemiological and laboratory surveillance capacities among animals and humans. This effort will most likely require immediate financial support from the W.H.O. and other multilateral institutions. This is also an area where Western countries can provide immediate assistance. Even in the absence of funds, African governments should conduct immediate reviews of their epidemiological and laboratory capacities and work closely with national professional bodies to begin updating systems and services. C. Plan and implement a monetary compensation mechanism to cover the losses that owners of culled birds and other animals may suffer. Experts now believe that an aggressive culling exercise during the 1997 avian flu outbreak in Hong Kong prevented a pandemic. African farmers and poultry owners need timely financial support to offset losses from animal control efforts. As noted from remedial efforts in Asia, swift financial support is critical in securing the cooperation of poultry owners and bird handlers. D. Develop and be ready to implement an emergency response in animals and humans at national and community levels. This will require close coordination of the activities of national and local governments, mobilization of the public and private sector, consolidating the support of professional organizations, managing the procurement of vaccines, anti-viral drugs and other medicines, and orchestrating the synchronized response of public health and public safety institutions during an outbreak. In particular, Africa should be in a position to obtain new vaccines that respond to new strains of the virus. E. Improve the capacity of local authorities and institutions to become agile first responders. The capacity of local structures to serve as first responders is critical to a robust response to an avian flu epidemic in animals and humans. This is a major challenge to national governments and African institutions since internationally directed initiatives often focus on strengthening national structures and capacities. To become agile first responders, local authorities in Africa should have operational epidemiology and surveillance systems; have veterinary and public health facilities functional; have antiviral drugs and other medicines ready; have enough trained public health inspectors for animal containment efforts; train community health workers on the need for high indices of suspicion on possible outbreaks; and, improve basic sanitary services. The H5NI influenza is now moving from Asia to parts of Europe. When the influenza crosses over from birds to humans, fatality is high, at present, more than 50 percent. Experts believe that it is only a matter of time before it reaches most parts of the globe, including Africa. Fortunately, a window of opportunity exists that can minimize the impact of an epidemic in Africa. African leaders, African institutions and professional groups should take the lead role in crafting a comprehensive continent response to a possible H5NI influenza epidemic.